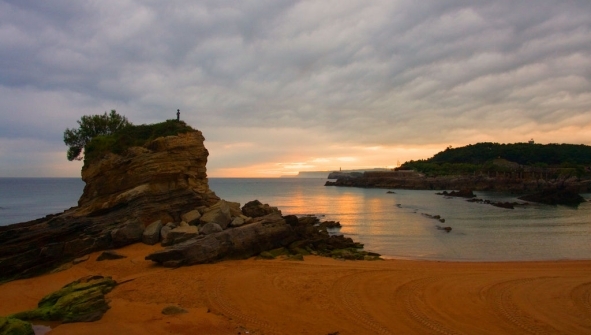 Cantabria, north of Spain, is 4 hours from Madrid and 7 hours from Barcelona, has a wide variety of bus and RENFE connexions, and airport of Santander. The history of Cantabria is sensible in every one of its streets, has a rich cultural heritage dating from prehistoric times, its famous caves of Altamira, and the cave paintings are incredible, international leader and declared a World Heritage Site by UNESCO. The caves of Puente Viesgo, El Pendo or Garma are also great exponents of the art of Oriental civilizations. Cantabria also guides you on the right track towards Santiago, its regions and towns hide for you Monumental gems like the Palacio de la Magdalena in Santander, the Monastery of Santo Toribio de Liebana or the Whim of Gaudí de Comillas. If you're already in the region, don´t miss the opportunity to visit Santander. A walk through the old town will give you the vision of santanderina wealth, the Cathedral, the Abbey of San Emeterio, Plaza arcaded, El Arrabal or Cubo. Among its most illustrious people you will find Santillana del Mar, Reinosa, Suances, Liéganes, San Vicente de la Barquera, Santoña and Laredo, many overlooking the sea. They attract visitors with its uniqueness as the beaches of Laredo or San Vicente de la Barquera. The cuisine is not far behind, its privileged geographical position provides fresh seafood, elvers casserole, lebaniego cooked, hake in green sauce or the delicious sobaos pasiegos are a clear example of how good food is in the north of Spain. Also Cantabria is full of cozy and charming hotels that introduce you in the different spaces between nature and town.